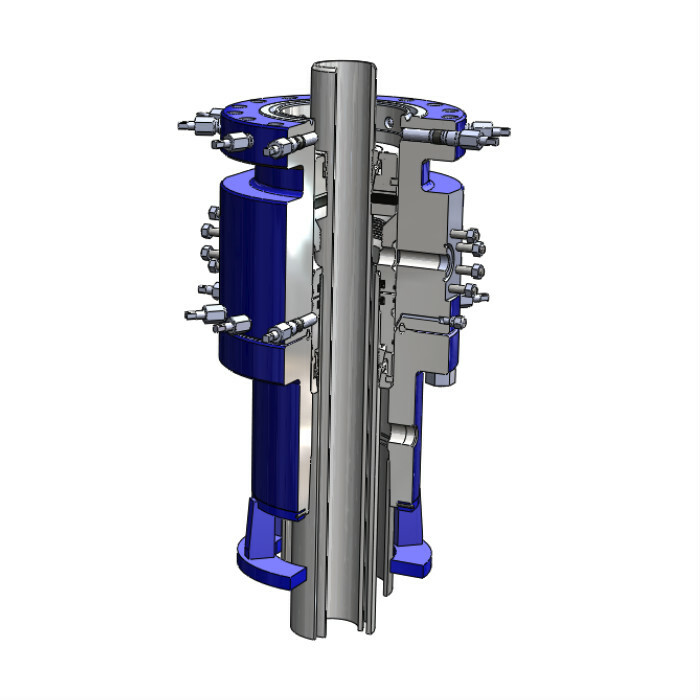 The UWS Multi-Bowl System is a wellhead assembly that provides a means to support and seal two casing strings, without the need to break the BOP stack. The assembly consists of 2 wellheads bolted together (Casing head and Casing spool). The lower section has a straight type bowl and a 45-degree load shoulder to support the lowermost casing string. The casing hanger is fluted to allow returns while cementing. A pack-off is installed creating a second load shoulder to support the next casing string. This pack-off incorporates seals to isolate the two casing strings and provide a means to test the wellhead seals. Emergency slip-type casing hangers are brought on all jobs in case the casing becomes stuck. Should this happen, the wellhead assembly is separated and the slip hanger is installed. The MBS System comes complete with a full array of rental tools. Wear bushings, running tools, standard and emergency casing hangers and pack-off support bushings, running tools for the casing hanger, pack-off, wash out tool and BOP test plugs. Provides a sealing point over the intermediate casing. Allows for pressure testing of the wellhead seals to isolate the casing strings. Allows for support and testing of a BOP system while drilling out both casing strings. Provides a casing hanger load shoulder and bowl for hanging and sealing two casing strings. Both load shoulders and bowls accommodate BOP test plugs. Provides two outlets on both the upper and lower spools for annular access and monitoring. Provides a means for Wear Bushing installation and retention in both sections. Accepts C-21 Casing Hangers for low weight situations. Improved Safety – Less time working under the BOP stack. Significant time savings – No need to break the BOP stack. Accepts standard wellhead completion equipment. Available in most casing program sizes. Emergency slip hangers available in the event the casing becomes stuck. Casing Hanger running tool can be tested on the rig floor, prior to landing the casing. Cementing is done through the casing hanger running tool as soon as the string is landed in the bowl. Casing Hanger is fluted to allow returns around the outside of the hanger. MBS assembly can be installed under the rig floor, or lowered through the rotary. Back-pressure valve profiles available in all mandrel hangers. 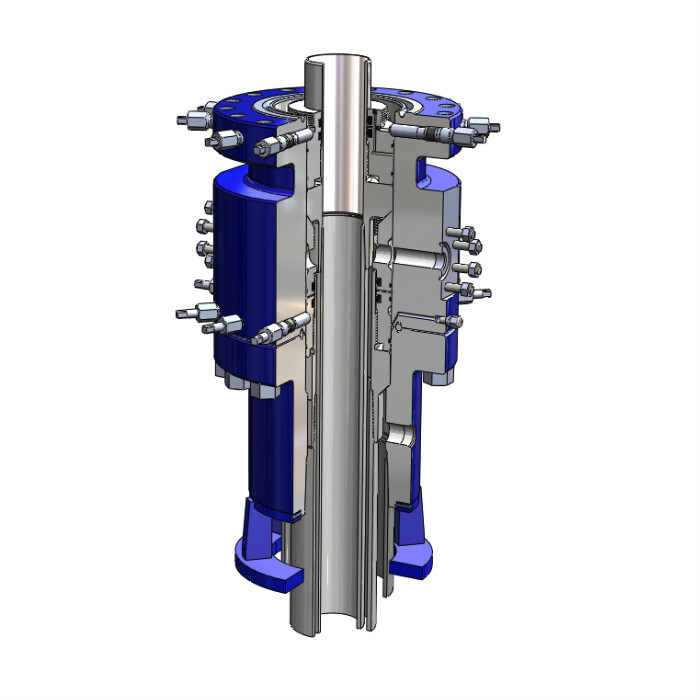 Upper housing can be removed and a conventional wellhead installed in its place.